DID HEDGECOCK HAVE ‘EM COVERED? 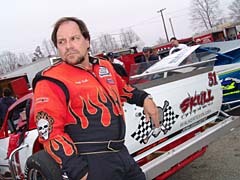 Longtime Southern Modified competitor and chassis-builder Jay Hedgecock may have been winner Ted Christopher’s biggest threat. 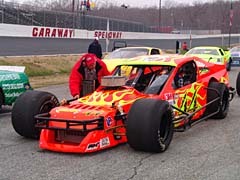 He led early until the bottom dropped out on him Saturday at Caraway Speedway. 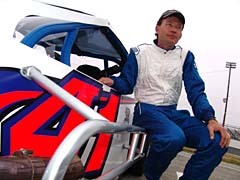 “It’s a shame because that’s the first motor trouble I had in four years,” explained the two-time Southern Modified champion, who finished 17th. “The car was exceptional; the best I’ve been down here in years. I really wasn’t going to run hard and I didn’t, but I got such a good start that I got to the lead pretty quick. I watched the 2-car and when he made a mistake I got the lead. I knew Teddy was smart enough that he wasn’t going to race early either so I just tried to set a pace and not push the car. 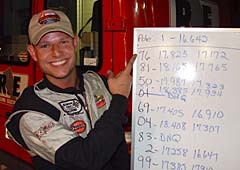 Brian Loftin is one of the highly-touted young guns of the Southern Modified scene. Everyone expects him to challenge for the inaugural NASCAR Southern Modified Tour championship, but his season is off to a rough start. After the redraw, Loftin was scheduled to start on the pole, but he didn’t even make it off the starting grid. “To be honest with you we don’t know what happened,” said Loftin, who was scored 21st in the finishing order. “It just quit firing out there. We brought it in and changed ignition box, the ignition coil and everything, but it still didn’t fire. We are lost right now. 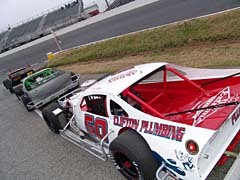 Ironically, starting off slow is not a new thing to one of the start of the Southern Modified Tour. Burt Myers is one of the most charismatic guys in all of racing, so it was quite fitting that he won the inaugural Bud Pole for the NASCAR Whelen Southern Modified Tour. His happy parade didn’t last long though. He went from the top to the bottom pretty quickly in the race, but fought back for a 14th place finish. “I wished I could tell you what went wrong,” said Burt with a shrug of his shoulders. “We have been fighting this car since we bought it last year. It’s got about seven races on it and on new tires it is awesome. When the tires get hot it seems to run off the right rear only and it gets loose. With the setup in this car tonight there’s no way it should have gotten loose. Burt’s brother Jason qualified well, but he too was not at the top of the pack at the end of the 150-lap race. It’s not what some expected from the Myers boys. “Imagine how we feel,” said Jason, who finished 20th. “We expected a whole lot more too. It’s just luck. We had a problem with the oil line and lost oil pressure. We have one car and one motor so when I see the light come on we are parking it. If we lose that motor then we gonna be sitting out and that’s not what I want to do. 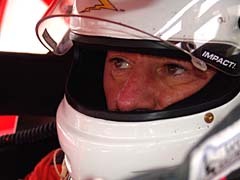 You think Tomaino is passionate about Modifieds, you should have seen that passion come through during the 150-lap race. He started off in the wild blue yonder after a poor qualifying attempt and would end up third. “I thought I was 20-years-old again when I time trialed because I went into the corner and I almost went through the wall,” said the 48-year-old with a laugh. “Starting in the back is not the end of the world; in fact, sometimes it is a better place to be. I think Earnhardt Sr. started in the back quite a bit and his record speaks for itself. Don’t think Tomaino is going to be a stranger in the South. Foley followed Ted Christopher to the line, but was two spots ahead of seven-time SMART champ Junior Miller and Tomaino. Michael Clifton tested the track in Altamahaw recently and feels he’s got the combination dialed in there. Problem is, the defending winner of the Caraway race was just a bit off on Saturday. “We didn’t qualify that well. It was a little slick and we got in the wall. We just over compensated for some things,” said Clifton, who plans on competing on the SMT as long as he’s got the money. Junior Miller is a seven-time Southern Modified champ, but he hasn’t won in the past couple seasons. 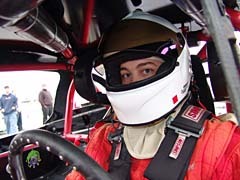 Saturday he began his quest to get back on top of the Southern Mod world in his Advance Auto Parts machine. It wasn’t quite what he hoped for, but a 4th place run will have to suffice for now. Frank Fleming has always been a calculated racer; that’s what has won him oodles of race in the Southern Mods. And in classic Fleming-style, he came away with a fifth Saturday night at Caraway. “The cars upfront wore their tires out and they were slowing down. 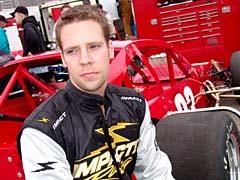 I had a great car all night; I just needed track position,” said Fleming, who started 14th. Young Alex Hoag is as calm as can be both outside and inside his modified, but he did give the veteran Fleming a heckuva battle. “I needed some more green there at the end. Besides Teddy I think we were the next best out there on tires. Those guys from Bowman Gray can really take up a lot of racetrack. 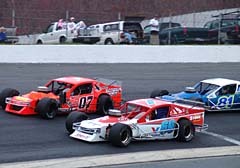 Hoag will compete in the entire Southern Modified Tour this year and he’ll do it from his home-state of New York. So to get a good start to the season was important for the grandson of famous Mod racer Dutch Hoag. 20-year-old Brian Crammer may not be able to legally get into a bar yet and it’s a good thing because he’ll be spending plenty of time on the highway this year. Crammer will haul his racer from New Jersey for every one of the SMT races. Saturday night he had a top-six run in the bag, when was squished by another car. J.R. Bertuccio made the haul from Long Island to compete in the first ever SMT race, but his night didn’t last long. Shortly after his contact with Cranmer, he was in the pits with the hood up. Bertuccio, unlike Hoag and Cranmer won’t be making the trek down for the entire SMT race, but he doesn’t rule out the possibility of more. 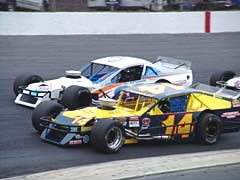 Bertuccio has a deal to race the Bear Motorsports #14 in the first three races on the Northern Modified Tour. Rupert Sink ran the SMART Tour and weekly and Bowman Gray Stadium last year and he plans to do the same this year, but his season got off to a tough start at Caraway. Sink tried to help out fellow racer Tim Brown, a regular competitor on the southern tour, during the inaugural event. Brown does plan to be at Ace Speedway this Saturday night with his own equipment. Nobody had a tougher initial weekend to the season than Brian Pack. All you have to do is listen to him talk about it. Gene Pack is a longtime supporter of Southern Modifieds and a fan favorite with his beautiful #31 racecar. Beauty doesn’t always equal success and that was the case at Caraway. That finish was just outside the top-10 (11th). John Smith’s never-say-die attitude paid off for him Saturday night at Caraway. He battled through adversity for a seventh place finish. “I had to get at it tonight. Hedgecock was leaking oil early on and they started to slow down and I went to the outside and when I did I spun in the oil and hit the wall,” said Smith. “Then we made an adjustment and went to the back and got past a few and blew a right front and that about put me in the wall again. I had to go to the back again. We came back to fifth, but I lost a couple in that scramble at the end. 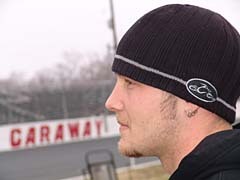 Bobby Hutchens left Caraway with an eighth place finish. Bobby’s gets a lot of attention since he is one of the top-brass at Richard Childress Racing, but at heart, he’s just a true racer. “It’s a lot better start than we had here last year; we destroyed two cars the first to races here last year. I am pretty happy. It’s been a year since I’ve been in a car at a track like this.”. Bobby Hutchens (14) & Brian Crammer (89).